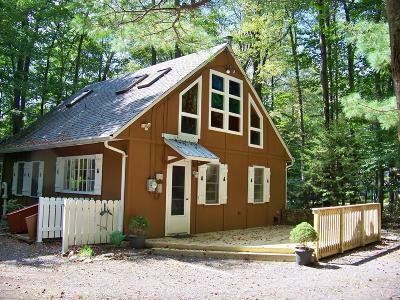 ''Make Family Memories'' in this 3 Season Charming ''Cottage Like'' Contemporary Style home on a private Wooded setting! Open Living Room/Dining Area, Galley Way type Kitchen, 3 bedrooms, 1.5 Baths! Washer & Dryer in Half Bath! New deck Patio! 1 Car Garage with workshop area! Screened in Gazebo! Enclosed screened in Porch; Woodstove and propane wall heater! All furnishings included except for a few personal items. Walk to the lake and beach area! Sale also includes Lot #203 (.5 acre-yearly taxes $429.24; dues:525;tranfer fee $400). Cash or financing must be a renovation type loan as there is no permanent heating system and ceilings are not insulated which are needed for normal type Financing.A property reassessment has recently been completed by Monroe County.